FBC Loretto regularly sends volunteer teams to The Bridge Ministries in Nashville. 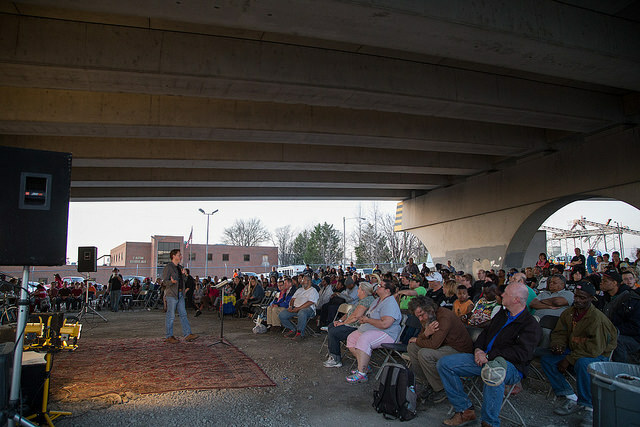 The Bridge “Tuesday Outreach” takes place each Tuesday evening under the Jefferson Street bridge in downtown Nashville, TN, regardless of the weather. While the praise team leads in worship, the volunteers serves a hot meal to our homeless friends. After the meal, a special guest speaker comes to bring the Word to our friends. At the end of the service, the volunteers distribute bags of groceries, toiletries, and new clothes to our guests. Weekly average attendance (not counting volunteers) is between 300-350, though they have seen as many as 500 attendees. Watch our Calendar of Events page for dates when you can volunteer.